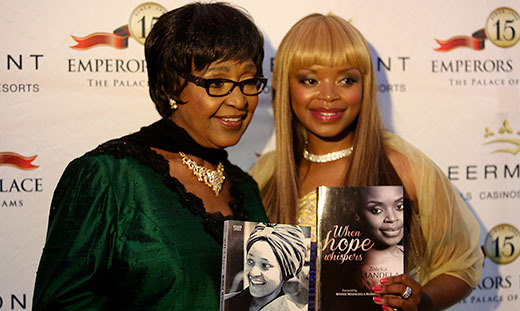 Winnie Madikizela-Mandela and Zoleka Mandela at the launch of Zoleka’s autobiography ‘When Hope Whispers’. Picture: Sebabatso Mosamo/EWN. 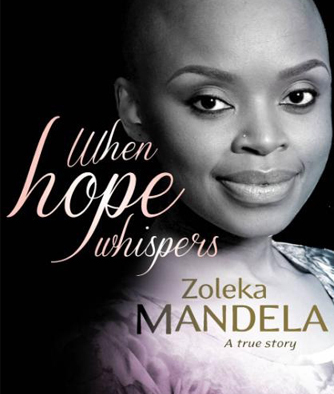 JOHANNESBURG – Former President Nelson Mandela’s granddaughter Zoleka has launched her tell-all autobiography When Hope Whispers. The book recounts the trials she has faced with her drug and alcohol addiction, her battle with cancer, the death of her daughter and her relationship woes. The book was launched on Tuesday at Emperors Palace in Gauteng. Wearing a gold dress, Zoleka broke down in tears during her speech and said a few years ago she never thought she would amount to anything. She said one of her biggest regrets in life was when she chose drugs and alcohol over her own children. In the book Zoleka relates that having been sexually abused from the age of eight, she took to alcohol to cope. She admitted she had her first drink at the age of nine. Zoleka was supported at the launch by her grandmother Winnie Madikizela-Mandela who commended her for her strength and tenacity. Zoleka’s daughter Zenani was killed in a car accident in June 2010. In 2011 she lost another child a few days after he was born prematurely . Zoleka has a 10-year-old son Zwelami.